My Dell Axim X30 PDA finally died after 5 years of faithful service. So I picked up another PDA from eBay: a Dell Axim X51v. 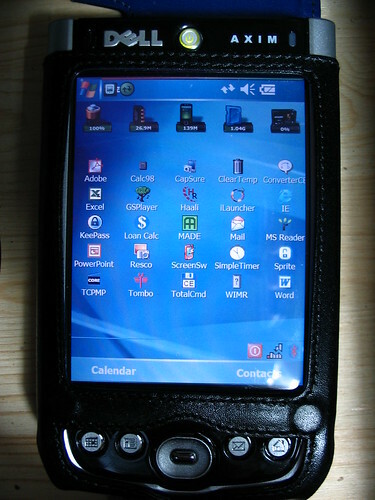 This was the PDA I lusted for back in 2005 when it was $500; these days, you can pick one up nearly new for $220. And this time around I got a proper case (Sena) and a good screen protector (BoxWave Crystal—though I hear these scratch easily; the matte BoxWave Anti-Glare may be better). Like it’s 2005: The Dell Axim X51v with Windows Mobile 5 (A12 ROM). posted by Jonathan at 12/05/2009 07:25:00 p.m.